By pure chance I was punching the counters on Inkermann 1854 today, when it dawned on me: today is November 5th - the 159th anniversary of the battle! Once I was done I ended up playing a few turns as my little way of remembering the anniversary. So, I put the challenge out there to those interested, not only in these wargames, but also the history behind them: try to pull out some of your favourites on the anniversary of the day they were actually fought. Let's see how many we can list! Getting the list started - how many more can we get?? Fought on the 5th of November, 1854, this saw vastly outnumbered Anglo-French forces defeat the Russian attackers on the heights to the east of Sevastopol, overlooking the Chernaya River. I also have an ancestor who fought in this battle - 2313 Pte William Hindley, 30th Foot - who was wounded by a musket ball to the elbow and subsequently discharged to a pension. Played 2013-03-28, 71 years after the event. On the night of the raid I was outside in the harbour area. It was a quiet night, hard to imagine what went on all those years back. 100th Anniversary = 3rd of November 2014. I hope it is released in time. There will be a whole slew of centenials coming up next year, of course. I am almost tempted to buy Togoland 1914 which (I think) models the first engagement of the war on 7th August 1914. 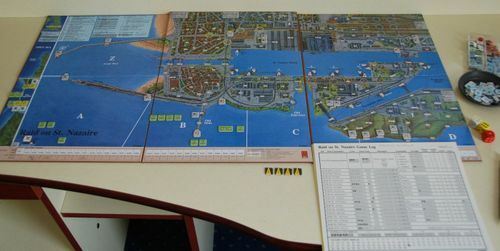 Several times over the past few years, I have played the Austerlitz scenario from this game on the battle's anniversary. It always seems to add a little extra meaning to the experience. The anniversary is coming up again soon. Not sure yet if I'll be able to fit the game into my schedule this year. I use to play this one during August September dates. Of all the games I played during anniversary times I would say this one got the most plays. I played Scenario 16 from CC:M last night, "The Blitzkrieg Checked", which pits the Germans against French Moroccan troops near Gembloux, France on 15 May 1940. It was actually quite unintentional, but my playing partner pointed out to me this morning that it was the 74th anniversary of the battle when we played it!